Quite a few years ago, as I sat outside with my early morning coffee, enjoying the birds, I heard the dulcet tones of my darling little daughter: "Shaddup, ya stinkin' birds!" She has never been a morning person. I planted trees when I moved into that house. My neighbors told me that the previous owner had not only removed her own trees, she tried to get them to remove their trees to keep the birds from -- ahem -- soiling her property as they flew across. Besides beauty, what are the benefits to attracting birds to our backyards? They eat insects, insects that would otherwise eat our plants. Why, you might ask, do I want birds in a yard where I'm trying to attract pollinators? Mosquitoes are pollinators. The birds can have all the mosquitoes they want! 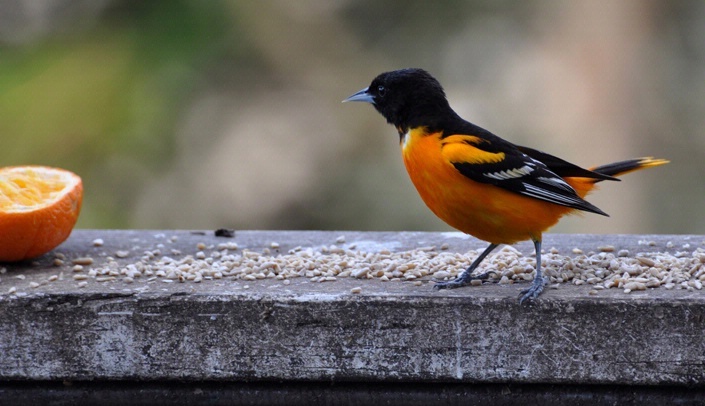 Some birds, such as hummingbirds and orioles, also are pollinators. The grackles are eating Japanese beetle larvae like crazy right now, all over the neighborhood. How can anyone complain about that? A vineyard manager in Napa Valley has reduced the incidence of grape blight by installing bluebird nest boxes. The bluebirds eat the insects that spread the blight-causing bacteria. Birds also distribute seeds. They eat berries and eliminate the seeds elsewhere. Sometimes I wish they had better aim. Nothing will grow on my porch railings or sidewalks, but I know that most seeds end up on fertile ground. Larger birds like hawks and owls help keep the rodent and smaller bird populations in check. Some birds eat carrion, keeping our environment cleaner. Bird populations serve as bio-indicators. In the 1970s, birds were dying off due to the use of DDT. Now DDT has been associated with breast cancer in women exposed to it in utero. Click here to read more about birds as indicators of environmental health. Some people worry about the potential mess birds may leave, and are concerned about bird feeders attracting raccoons and rodents. If you have bird feeders, clean and disinfect them often to prevent birds from spreading diseases to each other, and collect and dispose of materials that accumulate under feeders. Spreading out bird feeders and water sources (birdbaths and fountains), will reduce competition for food and decrease the possibility of birds spreading disease. Click here for more information. For information about how to attract birds to your yard, click here. Enjoyed your article, Anne. Great information!